What would it be like to share all your goods in common with your neighbors? Linda Maendel is a schoolteacher in a Hutterite colony in Manitoba, and could answer that question firsthand. Linda is also the author of an upcoming book called Hutterite Diaries: Wisdom from My Prairie Community. I’m happy to let you know that Linda will be sharing a look into Hutterite faith and life here on Amish America as we approach the release of Hutterite Diaries in May. Unlike the Amish, Hutterites live communally–on large colonies, mainly on the prairie lands of Canada and the upper Midwest. Another unusual practice, intriguing in today’s society: besides a few personal items, Hutterites share their material possessions with others in the colony. I’m looking forward to hearing from Linda because, besides scattered posts over the years, we haven’t had much here on the Hutterites, a people related to the Amish. And we’d like to ask for your help. We had the idea to ask you for your questions about Linda’s life on the colony and Hutterites in general. She’ll answer some of those questions here over the next weeks and months. The Hutterian Brethren or Hutterites are a faith group stemming from the Radical Reformation of the 16th century. Hutterites, Mennonites and the Amish share common roots. All of these groups are Anabaptists and trace their beginnings to the same era, to the same movement, during the Reformation. Unlike the Amish and the Mennonites, however, Hutterites live communally, following the teachings in Acts chapter 2. Today, Hutterites live in Manitoba, Saskatchewan, Alberta and British Columbia, Canada and in the United States: North and South Dakota, Minnesota, Montana, Oregon and Washington. Hutterites are mostly farmers, but many are also manufacturing things like ventilation systems, hog equipment, furniture, windows and doors. Many colonies, including my own, have their own teachers. I work as an Educational Assistant and teach German and English to students in K-8. In my spare time I love to write and since April I’ve been working on a book. 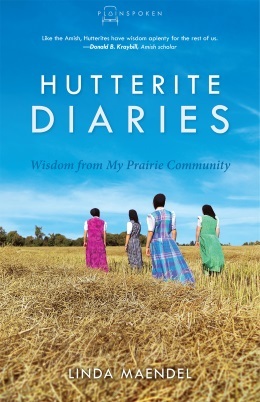 Hutterite Diaries: Wisdom from My Prairie Community, which is scheduled to be released in May, is part of the Plainspoken Series (including Chasing the Amish Dream and Called to be Amish), with Amish, Mennonite and Hutterite writers. What would it be like to share all your possessions and live in Christian community? In Hutterite Diaries, Linda Maendel offers a rare glimpse into the daily routines and communal faith of her people, the Hutterian Brethren. From stories of working together to bringing in the fall potato harvest to laugh-out-loud tales of sisterly love laced with revenge, Maendel invites readers into her Bruderhof, or colony, nestled on the prairie of western Canada. Here children and adults work, play, eat, and worship together, crafting a community of goods and living out an alternative to the individualism and consumerism of mainstream society. Because few outsiders know anything about the Hutterites, a Plain Christian group related to the Amish and Mennonites, this book offers a rare glimpse into Hutterite life. I first learned about this series when a friend sent me a query letter from editor Valerie Weaver-Zercher. Through it I learned Herald Press was looking for a Hutterite writer for their upcoming Plainspoken series. I was intrigued and responded to the letter, which led me to start working on this project. It’s been an enjoyable and enriching experience. I’m really looking forward to the release of this book, and to hear how people will respond to it. What would you like to ask Linda about the Hutterites? Let us know below! I know of a woman who lives “plain” but I am not sure what all that consists of, clothing wise. I am familiar with Mennonites and Amish but there are differences. How do Hutterite women dress and please give details of all aspects of dress. I know it is very difficult to join the Amish faith, how do Hutterites handle “outsiders” approaching them to join the community? Thank you! Hutterites live “communally”. Explain how this differs from Amish. Do they share all meals together? Do males and females live separately or do they live with their families? Do Hutterites live off the grid like the Old Order Amish (i.e. no electricity, computers, phones, etc.)? Looking forward to the release of your book. Wow…, at the number of questions that come to mind. 1. Is there really a Hutterite Mafia like I saw on TV? 2. Can I trust all that I watch on Breaking Hutterite? 1. 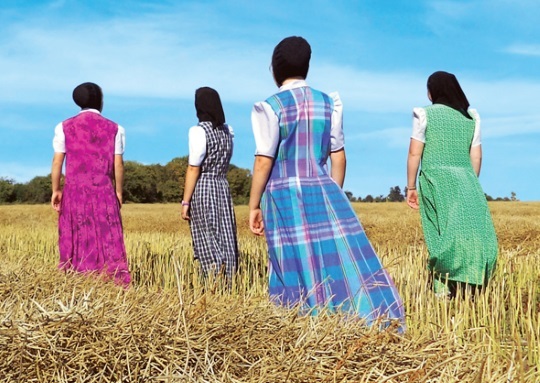 On the culturally-strict scale, how do the Hutterites compare to the Amish? 2. I know many Amish areas have cashed in on English tourism. Any of the Hutterites do that? How receiptive of outsiders are they. Do they have any issue with having pictures taken of them, or even posing for them? 3. Someone above asked about the dress/clothing distinctions. I’m curious about that as well, but would like to broaden it to just ask how do the Hutterites differ/compare (in cultural aspects) to the Amish. 4. Do they have a unique home-/heart-language (like the Amish speak PA Dutch), or do they just speak the language of the place that they live? That’s hilarious! Thanks for the good, clean humor! I would like to know a little about your religion, the doctrine of your faith. Do you have a church building? Is the sermon in English? I look forward to reading your book! God bless! My daughter recently got married & one of the groomsman is an ex-Hutterite, his parents still live in the colony in South Dakota. We chose to not serve alcohol at the wedding because neither family of the wedding party drinks alcohol (Brides family attends a Baptist church, Grooms family is Mennonite). But, this groomsman was telling us that alcohol is served at all weddings & other celebrations in the Hutterite colony; and anyone over age 15 is allowed to drink. Is this common in all of the Hutterite communities? Is there a problem with alcoholism in the communities? A few years ago, I read Mary Anne Kirby’s book “I am Hutterite”. If you are familiar with this book, did you find it an accurate depiction of the Hutterite lifestyle? I am Moravian Brethren which originated in the Moravian Province of Czechoslovakia under the leadership of Jan Huss. We were a plain and communal people for a period of our history. Can you tell if there is any historical connection between the Hutterian Brethren and us? I know that the Bruderhof people are also similar to us. Please explain how the Hutterites make decisions for the colony–is it by the leadership only or do members vote, etc? Also if you can think of some things that have changed within the various Hutterite groups since they were first founded, things that were not allowed at one time and now are accepted, etc. Thank you. I am intrigued as to how families live in your community. Do they all have separate dwellings? Do you eat together as a community or do the families eat as a family? What percentage ( approx.) of the children will choose to remain in the community as adults? And do they tend to marry inside the community or do they bring in outsiders? I am blessed to be friends with a number of hutterite women and love them dearly and learning their traditions and beliefs is wonderful! I know the Amish observe Sundays rather than Saturdays as Worship Day. Is the same true for Hutterites? And as asked above, I too would like to know whether Hutterites have their own dialect, as Amish do. 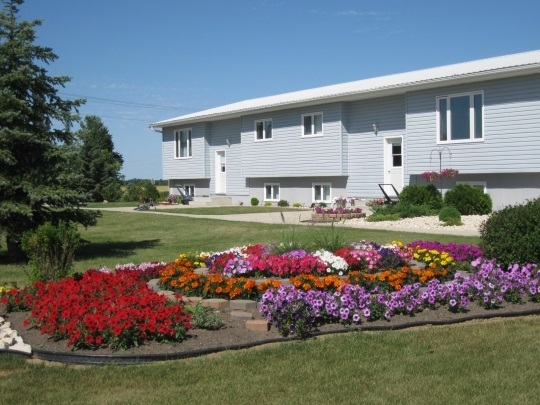 Are the Hutterites similar to the Amana Colonies whose decent is also from Germany and share everything in the community, have little possessions and strong faith? The BBC had a documentary called “How to Get to Heaven with the Hutterites” which, I thought, was biased towards youth leaving & strict “rules” that made them do so. Like SO many of these types of shows on other plain groups, like Amish, Mennonite, Primitive Baptist, etc, we know they are mostly one-sided and full of animosity towards the plain life. My questions are how many youth DO really leave the faith permanently, as compared to the ones that run away and come back. And if there is a difference if they are NOT full members of the church, like the Amish rules…..is the “punishment” less if they run before committing, or is it the same? 1. Do the Huterites still have a colony in Nigeria? 2. Where do the Hutterites stand regarding cell phones, internet usage, and television? 3. What about education? Can a Hutterite go to college? 4. Do Hutterite colonies really divide when the population reaches between 100 and 150? What kind of medical care are Hutterites allowed? Do they give birth at home with midwives, or is hospital birth OK? Is there more “alternative medicine” and chiropractic, as with many Amish? Are they for or against immunization? Are there any Hutterite doctors (MDs, with degrees & a license)? I’d be interested in anything “medical”-related that might set the Hutterites apart from other Plain people. I know there are 3 major divisions among types of Hutterite communities, but I’d like to know more about the commonalities and differences. How/why did these differences evolve? Do members of different Hutterite “denominations” look on each other as misguided? Or is there more fellow-feeling than that? My name is Jody and I am a 53 year old wife, mother and grandmother diagnosed with liver cancer. I am very much interested in writing to a Hutterite woman around my age. Is this possible? Thanks! Hi Linda, I visited a Bruderhof in Connecticut 37 years ago. This is very trivial, but I’m trying to recall if the women there wore black head coverings with white polka dots? Or, conversely, is that type of head covering the type that your Hutterite women would wear? I don’t see photos of Bruderhof women with them on, but nowadays with plain single solid print head coverings. Thanks for helping me remember. 37 years ago the Bruderhof did wear black head coverings like the Hutterites. Today their head coverings are any color.